How often do you eat it? Is it a staple? Is it an anomaly? Do you know what it is? I can't say I was raised on the stuff, and I also can't really admit to it being a staple (I'm not sure I even have staples....), but it's something that both hubs and I absolutely love. Funny how my best acquaintance with this north african grain didn't happen anywhere in Africa (never been), rather, in France. And in a university cafeteria, no less. I want to explain a little more about the culture *I* experienced in France before I explain a little more. I can't pretend to comment about the totality of French culture, but the small microcosm to which I was briefly privy gave me (I think) a decent insight into certain cultural influences. In the 60s (and since) there was a large influx of north African immigrants into France - people from foreign French colonies like Tunisia, Morocco and Algeria flooded the French suburbs. Though the French have staunchly denied these people any sort of real French identity (even second and third-generation immigrants were still generally considered foreigners), there have been some small culinary inroads made into French culture. Two such inroads are couscous (small pasta grain) and merguez (spicy lamb sausage). These were two items that I seldom see here in Canada but that were all over the place in France. And hence my exposure to them. When I was trying to figure out tonight's dinner (I generally at least attempt to plan on Sundays), I remembered the merguez I had sitting in my freezer (a random purchase) and the couscous sitting in my cupboard.....and then I found a recipe in my trusty Cooking to Beat the Clock that totally fit the bill. ***Just as a little plug for a fave cooking aid - Cooking to Beat the Clock is about getting meals on the table in less than 15 minutes. Tasty meals....not of the frozen variety. I'm not quite as quick as Sam, but I love this book for inspiration and methodology - a great resource for the rushed and lazy home cook. 1. Boil about 2 cups of water in your kettle. Measure 1 1/4 couscous into a small saucepan. 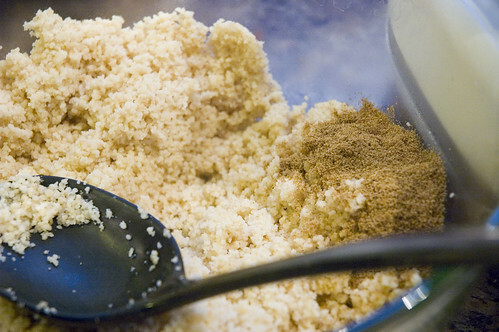 Once water has boiled, pour 1 1/4 cups of it over the couscous. Stir and cover. 2. Meanwhile, put a large heavy skillet over high heat. 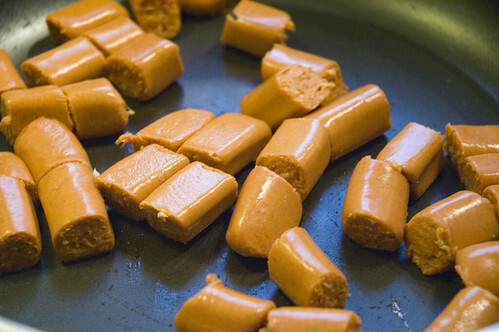 Cut the sausage in 1-inch pieces. Add the sausage to the skillet, cover and cook for about 3 minutes. Turn once and cook for four minutes. 3. While the sausage cooks, trim the onion and cut it in quarters. Put it in a food processor and pulse until coarsely chopped. Core and quarter the tomato. Quarter the red peppers. 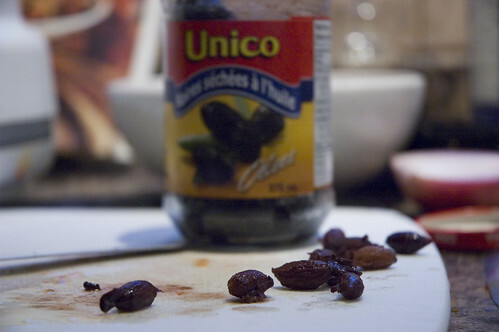 Pit the olives. 4. 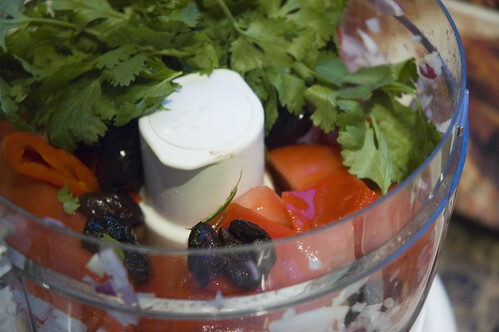 Put the tomato, peppers, olives, and coriander (or mint) in the food processor with the onion and pulse several times until corasely chopped and combined. 5. 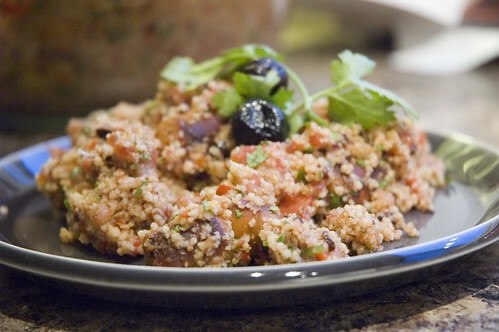 Put the cooked couscous in a mixing bowl and add the onion/tomato mixture, cumin, salt and hot sauce to taste. 6. Mix and fluff with a large fork. Add the sausage and combine well. Serves 4 - feel free to garnish with a sprig of herb, or an olive or two. :) ENjoy! Thank you for reading. I know it seems trite to be reading about frivolous food when there is so much violence and nastiness going on....but sometimes I think it's the little things in life that keep us sane, that cover us in the trappings of civilization, and allow us to explore without pain or violence. My heart goes out to all those globally who've been affected by such violence. Yea!, I have been stalking your blog looking for updates. This looks delish. I'm adding it to my recipe files. Where in Ottawa do you find merguez? I *heart* couscous... very often a bowl of couscous with random veggies makes a really good lunch for me, and I think it's brainfood in a way, because it always gives me the energy to face the rest of the day. I also like couscous as a side dish, eg with lamb or chicken, or a huge plate of couscous with chickpeas, chicken or lamb etc. Another thing I'm really fond of is burghul wheat, very versatile and very healthy. Another very enjoyable read sweetie, I wish I could have been there for the torte..."AWEMAZING!" By the way my darling...is that "Cooking to Beat the Clock" cookbook the one you, ahem, shall we say "SNITCHED" from your mama? lol. The coucous dish looks great, my mouth was watering, I'm going to try to find the sausage to make it soon. plantchick - you can find merguez at the Butchery in Bells Corners. I'm sure you can find it in some of those great shops in the Byward market too....but I'm a West End girl. :) I also have found the butchery to be a reliable source of chorizo too. athena - couscous is just great. I can't wait until my patio is ready. I'm going to have tabbouleh on the patio for sure. i love couscous but my husband hates it....so i try to make it when he's not around. or sometimes i just make it and what's he gonna do? cook?? ha! this looks yummy! We had your butter chicken tonight. YUM! Big hit, thank you!